As the rain started to spatter the windscreen, I regretted leaving my waterproof trousers behind. This was not what the weather forecast predicted for mid July. A ‘mizzle’ (a sort of misty drizzle) hung over the sky as we reached the visitor’s centre in Clovelly and we hurried inside. The lady on the desk was not a mine of information and didn’t really know where the start of the South West Coast path was. My sister and I had planned to walk just over 25 miles of the 630 mile path which is continuous round the coast of Devon, Cornwall and Dorset. This was the first of three days of glorious hiking, we hoped. We had a cup of tea in the centre and looked around for maps and information. The books were designed for people sitting on the couch reading about the coastline rather than those wishing to walk. There were an awful lot of knick-knacks and an enormous amount of fudge. Clovelly is a private village and you have to pay to enter. 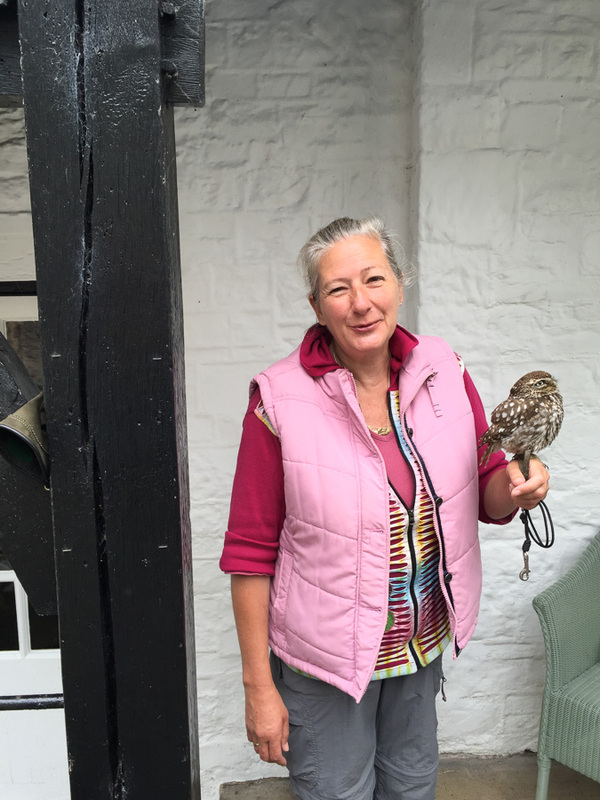 This lady has many owls – very interesting chat. After weaving our way past a large party of German pensioners we soon stood at the top of the steep main High street made of pebbles. Even under an overcast sky it is chocolate box pretty and must be heaving during peak season. There was quite a bit of renovation going on and the workmen were pulling their materials up on sledges as the village is car-free. The alternative is by donkey although I think they are for petting not toil these days; we didn’t see any. Clovelly had been yarn-bombed and crafty ingenuity ranged from a whole knitted beach-hut to a field of woollen pom-pom flowers. The high street leads down into a pretty harbour where you can buy some legendary hot smoked mackerel rolls. We plumped for a pasty for later and, after a fascinating chat to a lady with an owl, made our way up to the coast path. A large sign on a gate showed up we were in the right place and from then on the whole path was meticulously signposted with little acorn markers (derived from the National Trust emblem). We could have done without the map but it did help us to gauge how well we were doing. 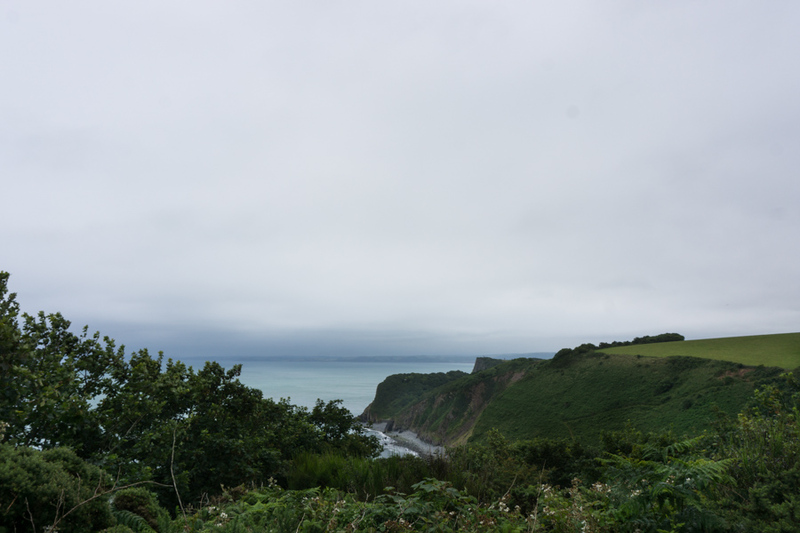 With ten miles ahead of us we strode off through woodlands and onto a path bordered by shrubs and trees with glimpses of the sea below, stopping only for a short pasty-eating break. 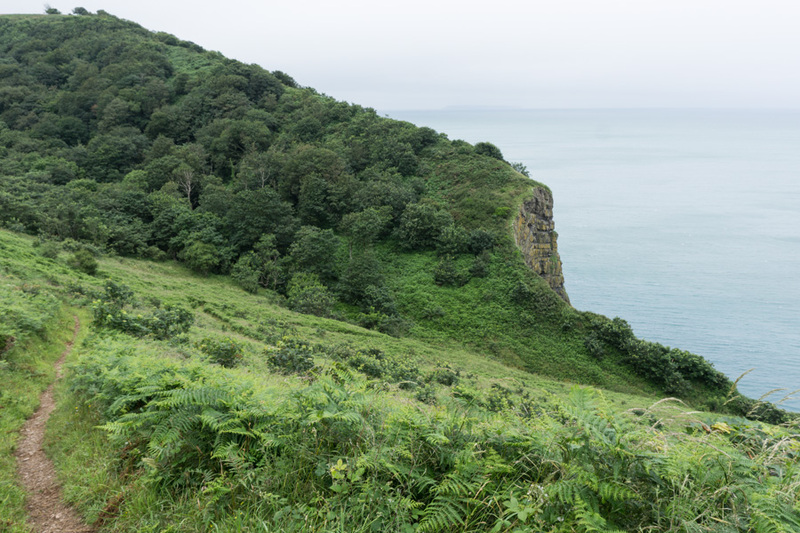 We soon came to a wooden carved shelter known as Angel’s Wings, built in the 19th century by Sir James Hamlyn Williams, a former owner of Clovelly. He sited it here so that he could look across Bideford Bay to where his daughter, Lady Chichester, lived at Youlston. The name comes from the carvings of angels and angels’ wings supporting the roof. 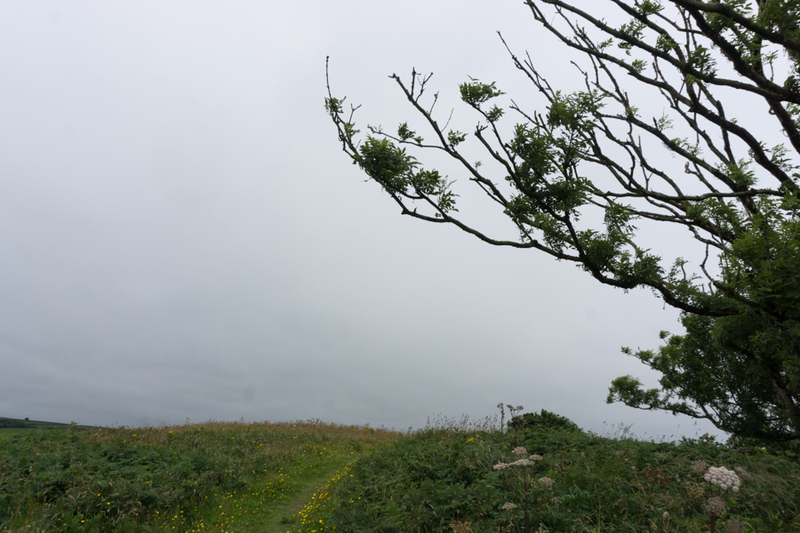 Our walk was fairly gentle until we reached some steep and narrow winding paths going up through woods. 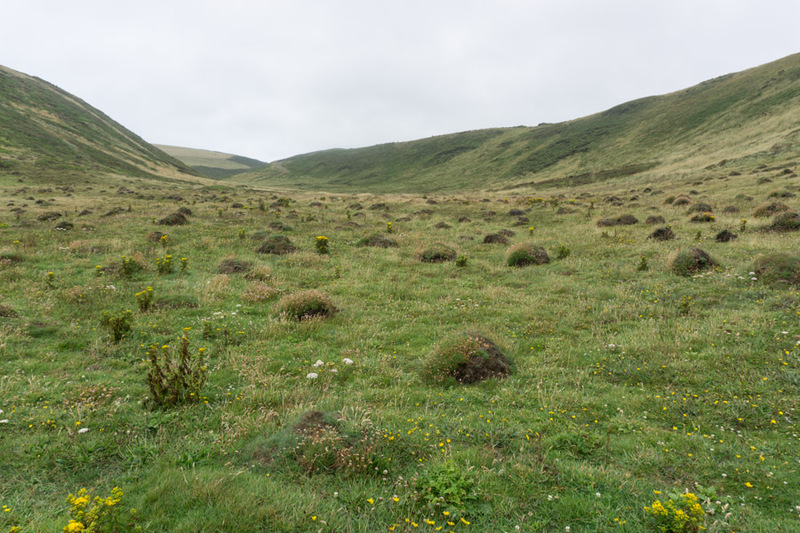 Once at the top there were a series of open fields climbing upwards. It started to rain and the wind made it heavy going. 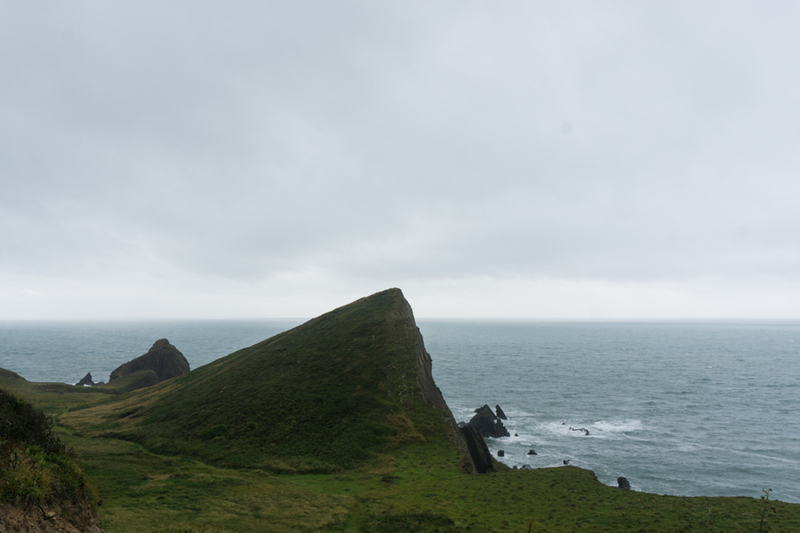 Eventually we saw glimpses of the Sonar ‘mushroom’ and the promontory of Hartland point. 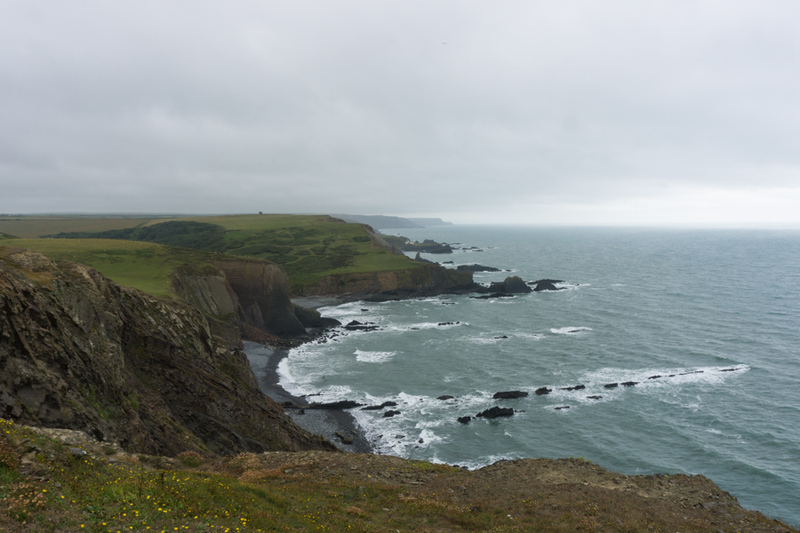 The coastline started to become more dramatic which buoyed our dipping energy levels. Then we spotted something down below in a car park and my sister ran down the hill in excitement. 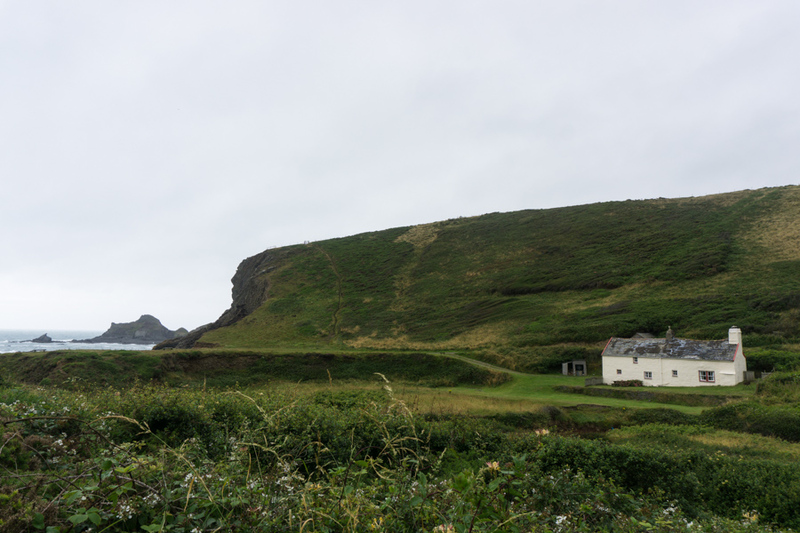 The Point at Hartland is a fantastic little tea cabin with a range of homemade refreshments. We were super impressed that they even stocked Compeed plasters – take heed Clovelly visitors centre! The steaming mug of tea restored us while we had a nice chat to the owners and a lady who was celebrating her birthday. The Point – gluten-free cake and blister plasters! 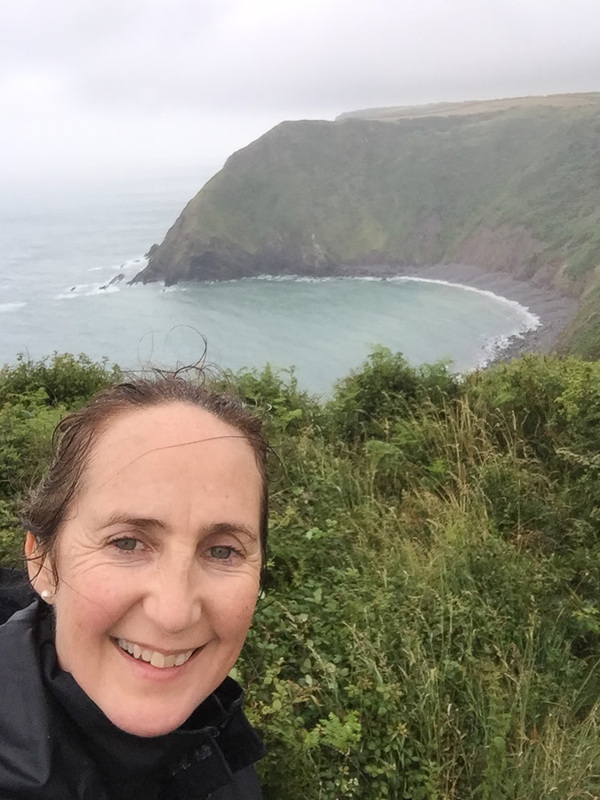 Rounding Hartland point and starting to walk along the Atlantic coastline we had around 3 miles to go. These were really tough with steep descents and ascents through dramatic river valleys – a taste of things to come for the next day. Eventually we reached the level higher ground, hiking past the remains of a folly and turned inland to Stoke across a path through a field. 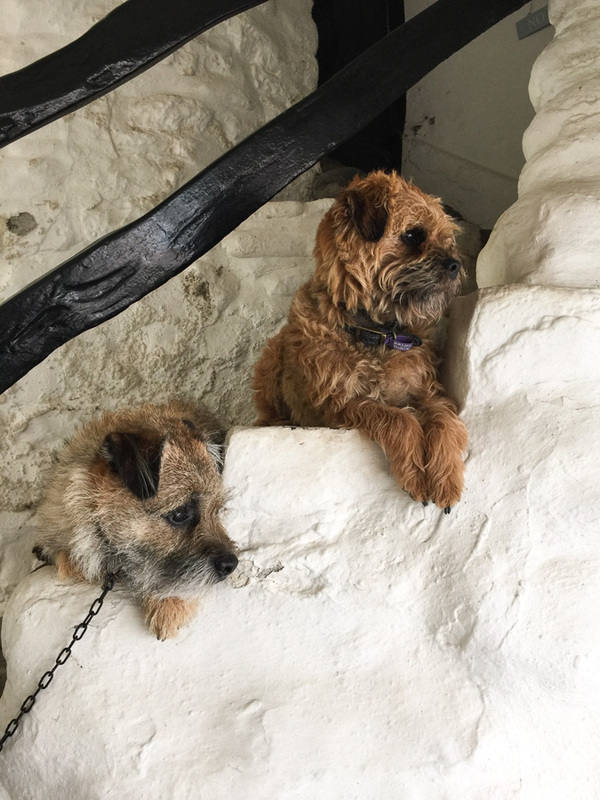 It was a short walk to 1 Coastguard Cottages and Anna the owner welcomed us warmly in every sense. She whisked our damp boots and belongings onto the Aga and supplied us with a brimming bone china teapot full of hot tea. There is only one place for an evening meal here – at the Wrecker’s Retreat – although I believe you can arrange something with Anna too. 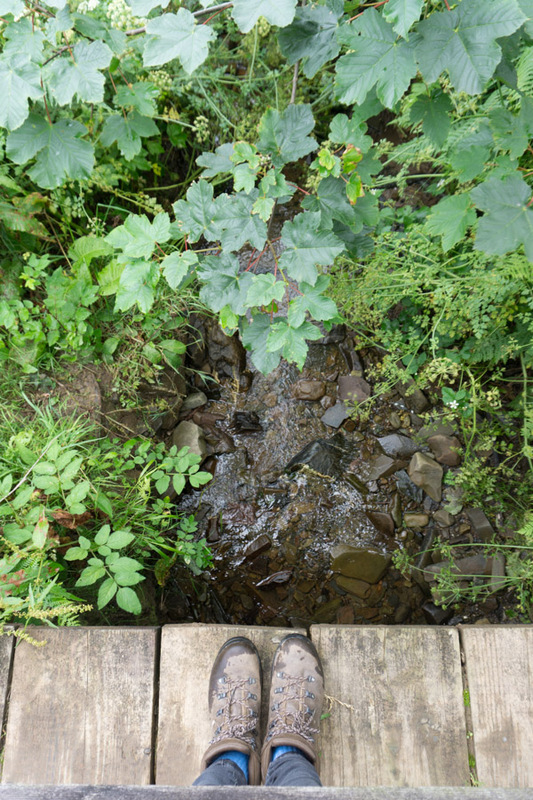 Boots back on, our weary feet made their way back towards the coast and down a steep narrow path. 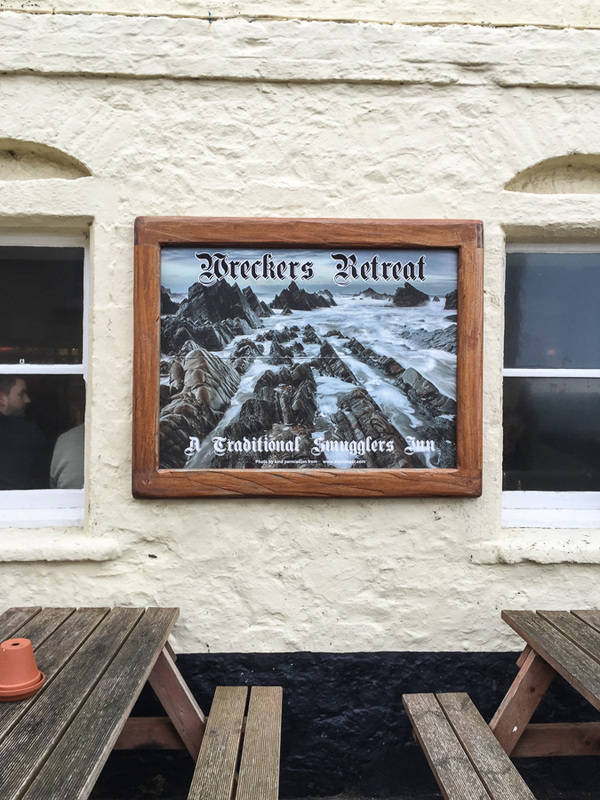 The Wrecker’s Retreat is in the Hartland Quay hotel and has a phenomenal view of craggy granite carved bays. It was once a thriving port in ancient times and the hotel is in converted warehouses and custom houses. The Wrecker’s pub is in an old stable block. 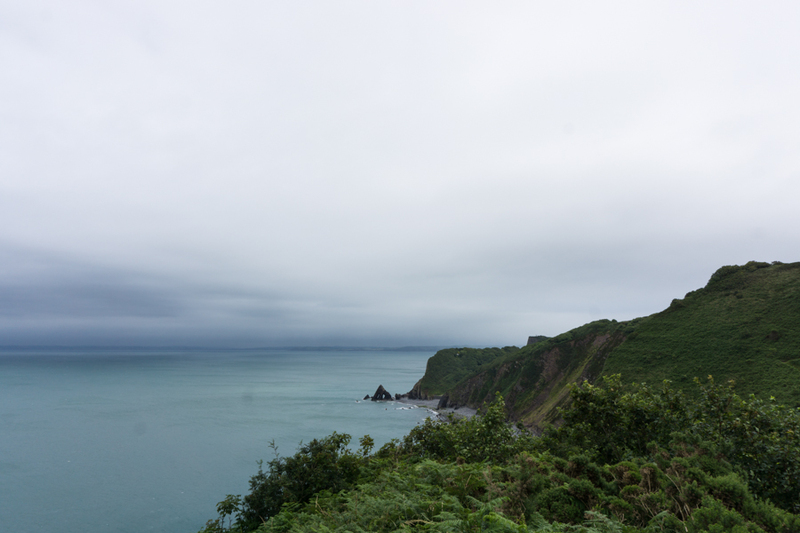 There is a small museum which tells the story of four centuries of shipwrecks and heroic life saving services on this beautiful but treacherous coastline. We entered the packed, warm, lively pub and were dismayed to find no tables available. However, after a short while we bagged one and tucked into fish and chips. 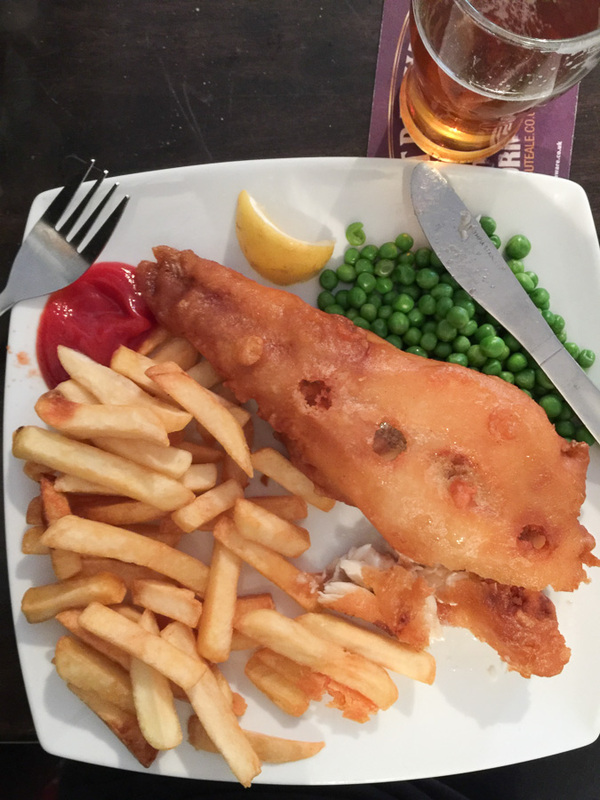 The menu is unpretentious pub food, well cooked to order. Our fellow diners were a good mixture of foreign hotel guests, well-heeled British visitors, and locals. While sipping local ale (I recommend Legend from Dartmoor Brewery) you can view some relics of wrecks, including the ‘Green Ranger’ of 1962, that are part of the interior. 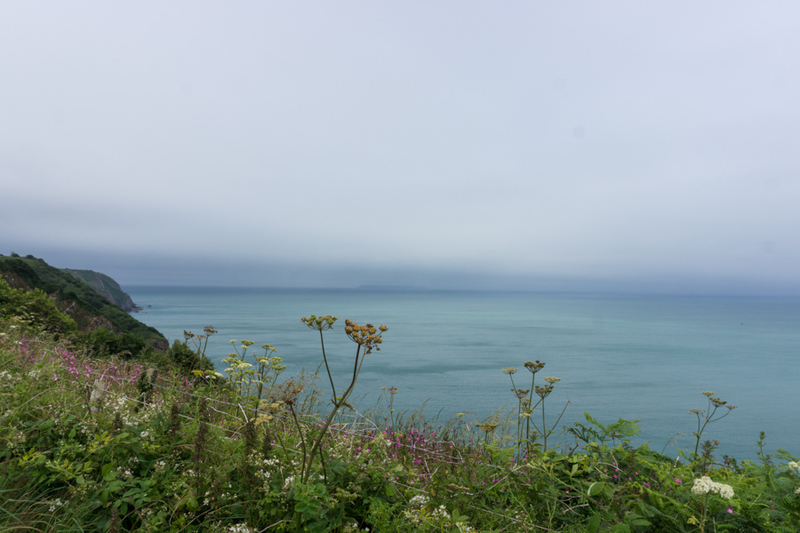 It was while enjoying our rest and evening meal we read that our next day’s 15 mile hike was the most challenging and strenuous of the entire 630 mile coast path. Eek! With trepidation we climbed back up the path stopping every so often to look at the stunning sunset over the Atlantic. There was only one thing for it. We put in our order for a full English breakfast complete with homemade sausages and bacon from Anna’s pigs and eggs from her hens. Tomorrow would be quite a challenge but our spirits would feel brighter after a good night’s sleep. I’d emailed ahead for the long-term parking arrangements and handed over 12 GBP for three days. Mrs Unhelpful at the Visitor’s centre advised me not to display the ticket in my car so I think I could have easily parked for free. The fee to enter Clovelly includes parking for the day so I ended up paying double for the first day too. Lesson learned. 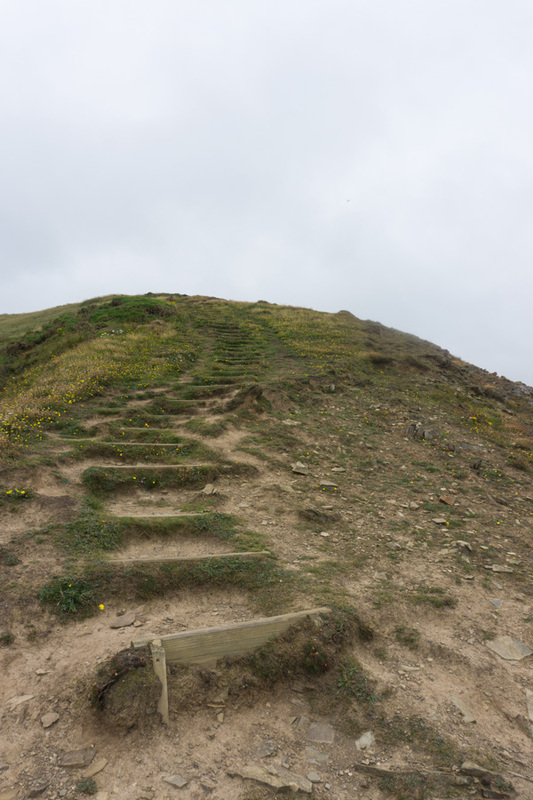 Our next hike was Hartland Quay to Bude, followed by Bude to Crackington Haven on day three. 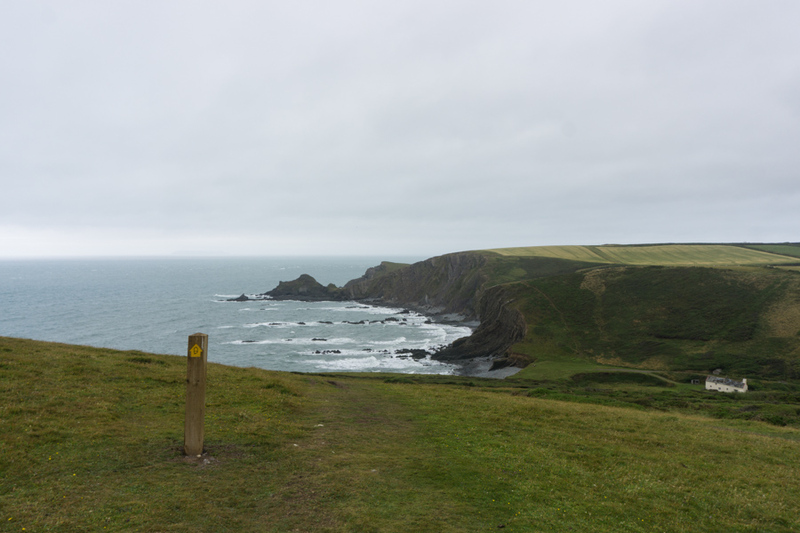 Have you done any kind of hiking route or some of the South West Coast Path? What were your biggest challenges? I would love to visit the UK again. Superb post Sally. Magnificent landscapes. That is such a great place for walking. Lovely bedroom and cute chicken plate. It was a spectacular walk Rosa – very lucky. ….. felt I was walking with you sal! Aw – thanks Marc. Wheezy lungs and all. Such beautiful scenery, we have such amazing places in this country. And I love Clovelly, it’s looks so pretty, and the yarn bombing looks so cool!! It really was so pretty Elaine. The yarn bombing was insane! Dramatically different Margot – would love to do a comparative hike! 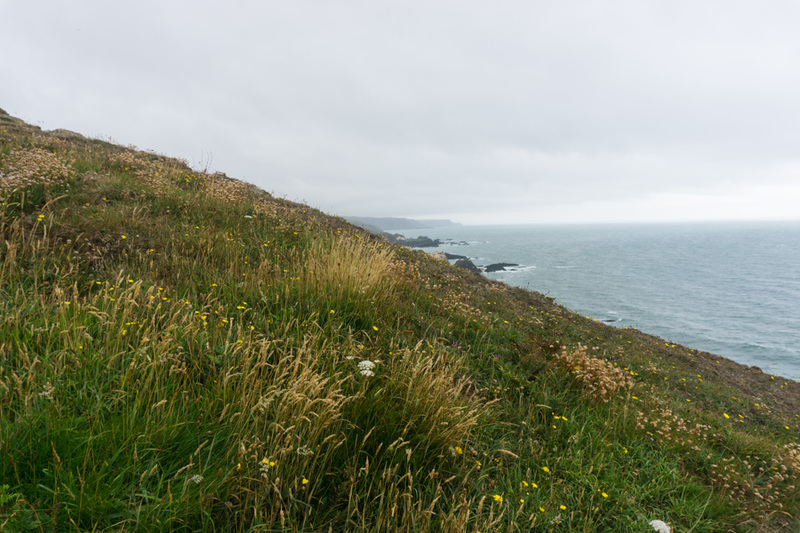 I love Cornwall and the coastal views, but I’m not a big walker so I’ve never walked any of the coastal path. It looks so gorgeous. I remember going to Clovelly as a kid, probably about 40 years ago, so was looking forward to going back but was rather surprised when we visited maybe ten years ago to find that entry was being charged. I do understand though, it’s such a tiny place it’d no doubt be overrun without doing so and this is probably the only way to make an income that all the residents can share, making the invasion of their home at least a little less of an inconvenience! It’s a bit weird though living in a virtual museum! Lovely to visit would not like to live there! I rather like the rain as I’m rather starved of it the rest of the year! Beautiful walk! I did the St Ives to Penzance section in June this year. It was amazing, and now I want to do the whole thing!